If you’re planning a trip to Table Rock Lake, this is one destination you won’t want to miss! 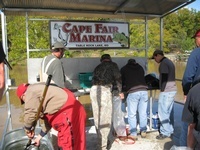 Cape Fair Marina is a full-service marina located near the popular James River Arm of the lake in Cape Fair, Missouri, where the water is clean and the fishing is great. We’re the nicest, full-service marina on the lake. Come check us out and you’ll agree! Our modern facilities include a full-service gas dock with pump-outs, beer, gas, ice, and all of the convenience store items you’d expect. Launch your own boat at a nearby US Army Corps of Engineers launch ramp or rent one from us. We have a full line of pontoons, tritoons, wake and ski boats, and fishing boats to choose from. Plus we have paddle boards, kayaks, a bass buggy, and pedal boats for rent. For the fishermen, we have JOE BASS TACKLE SHOP – a complete tackle shop with live bait. Phone: 417-538-0383. During the summer months they also have handcrafted Ashby’s Sterlings ice cream! After a day of fun in the sun, be sure to stop by FLAT CREEK RESTAURANT right here at the marina – the best place for good food lake side. We look forward to serving you! Phone 417-538-4164. FIREWORKS! Join us for our summer finale Fireworks Show right here at Cape Fair Marina. We have scheduled them for Saturday September 2nd, 2017. We will start at 8:30pm. You don’t want to miss it! Also visit Hideaway Marina, Table Rock Lake’s first marina established in 1956….and newly remodeled!